Sweet Americana Sweethearts: Early Birds & Night Owls-Come Join Us! Each author is assigned a half hour in which to share with you their latest books, links and maybe a game or two, so come join the fun. EARLY BIRD ~ NIGHT OWL works two ways. First, we have our times split into two groups - one to accommodate those authors and readers who are available earlier in the day, and others who, due to work or other commitments, are more available later. Of course, we love it when those who are available all day keep an eye on their Facebook notifications and regularly join each author to see what she has to share. An EARLY BIRD prize will be awarded at the end of each author's half hour to one person among those who leave a comment during that author's half hour. 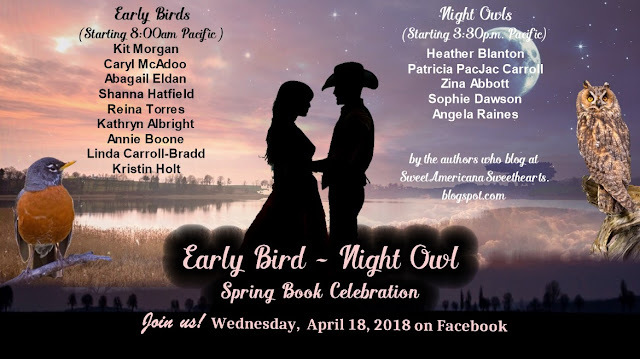 One NIGHT OWL prize per author will be awarded after the event is over to winners selected from event participants who leave comments throughout the day. All prizes will be selected using random DOT org.